STAAR testing time has come. 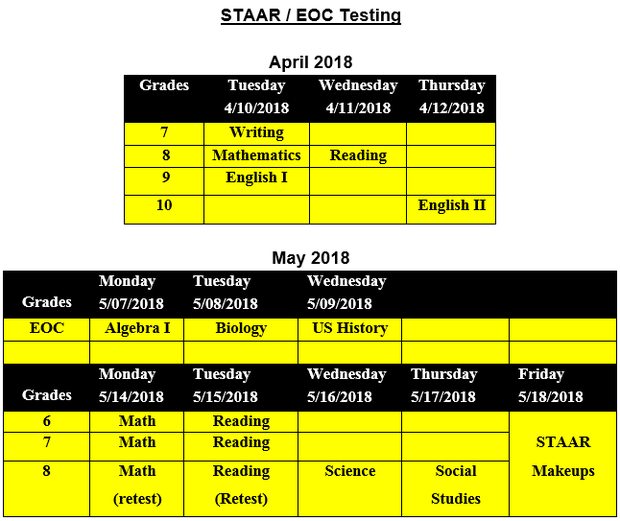 In April, 7th through 10th grade students will take the STAAR /End of Course tests. We are confident that our students are ready. Students and teachers alike have been working rigorously since the beginning of the school year to master the skills needed to be successful on the STAAR tests. The State of Texas Assessments of Academic Readiness (STAAR™) is a state mandated test that measures the statewide curriculum in reading at Grades 3-8; in writing at Grades 4 and 7; in mathematics at Grades 3-8; in science at Grades 5, 8; and social studies at Grades 8. All students enrolled in those courses are REQUIRED to participate in this testing. Satisfactory performance on STAAR tests is a prerequisite to grade promotion in grades 3-8. The tests that will be administered in April are on the table above. Several things you can do to help ensure a successful testing experience is that your student arrives on time, fully rested and prepared to test. It is also important to make sure your child eats a good dinner the night before, if not a good breakfast the morning of testing. Similarly, encouraging your student to do his or her personal best can greatly improve self-confidence levels leading to better performance. Thank you for all you do to help your student be as successful as possible, and for all of your contributions to Harmony School of Innovation. I will be more than happy to assist if you have any questions.